After completing orthodontic treatment, your teeth need time to heal and adjust to their new position. Teeth are always on the move, especially when they’ve undergone dramatic shifting from orthodontics. In fact, the first few months after treatment is when they’re most susceptible to shifting. This is because the bone and tissue are just beginning to heal around the teeth’s new positions. While failing to practice proper aftercare is one of the main reasons patients come back needing realignments as adults, relapse is always a possibility. For example, people who grind their teeth or experience tooth loss are more likely to experience teeth shifting. It can also be influenced by a patient’s genetics or age. Regardless of the relapse, your cosmetic dentist in Scripps Ranch does everything he can to help you keep your smile. What is the Purpose of a Retainer? Retainers are orthodontic devices designed by your dentist and typically given to patients after orthodontic treatment. They’re main goal is to keep your teeth in place to prevent shifting within the first few months after braces are removed or the use of clear aligners is discontinued. For the most part, retainers are not visible, so you won’t have to worry much about your appearance changing while they’re in use. While most retainers are a lifetime commitment, the amount you wear them can depend on the retainer your dentist provides. Retainers come in a few forms. 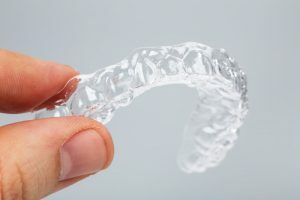 Depending on which dentist you visit, you may receive a retainer that looks more like your Invisalign clear aligners, or one that looks more like a traditional retainer. Let’s examine the most common ones below. Typically, retainers are worn day and night for one year after orthodontic treatment. After a year, your dentist will likely request you only wear them at night, and eventually one to two times a week. Cleaning your retainers may involve simply having a good oral care routine or removing them to brush and soak in a separate container. Have more questions on aftercare when the braces or clear aligners come off? Schedule an appointment with your dentist today! When you visit Dr. Greg Friedman for Invisalign in Scripps Ranch, you’ll be happy to learn that he was ranked in the top 20 best orthodontists in San Diego. Whether you’re pursuing orthodontics as a child or as an adult, he can get your smile straighter and healthier than ever! To learn more about his practice, contact him through his website.